Perfect for Shavuot, a Shabbat lunch, Sunday picnic or even Yom Kippur break-fast. At least several times a year I am privy to a conversation about the downfalls of social media. And how no one talks to one another anymore. As someone who uses social media professionally, I generally disagree citing countless examples of how social media has allowed me to stay in touch with friends across the world; keep up with news in real-time; and learn new things. 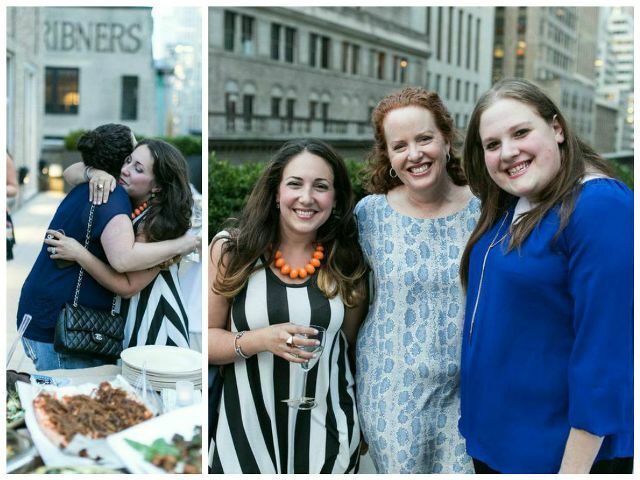 And two weeks ago, on a beautiful summer evening, the wonders of social came together to allow myself and a group of kosher food bloggers to take the fun of our online personalities and meet one another, share a meal and talk food in person. 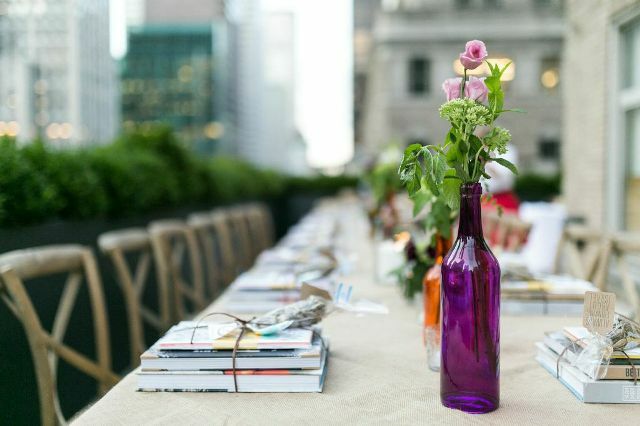 Cookbook author and teacher Kim Kushner hosted the lovely outdoor evening, called #kosherfoodiepotluck, where each one of us brought a kosher, dairy dish and a sat around a large, expertly decorated table to what else: eat and talk. There were so many delicious dishes (especially some homemade cronuts by Chef Chaya), but my favorite part was getting the chance to meet so many other bloggers that I have known and followed for years. Here’s me meeting Melinda Strauss of Kitchen Tested for the first time. I am a hugger, thankfully she didn’t seem to mind. And on the right is me with Liz Rueven of Kosher Like Me and Miriam Pascal of Overtime Cook. You might be wondering, soooo….what did YOU make? I wanted to bring one of my husband’s favorite dishes, and I didn’t want to start creating a crazy new item for the first time. I also wanted to bring something that would transport easily, could use seasonal ingredients and could be served room temperature. 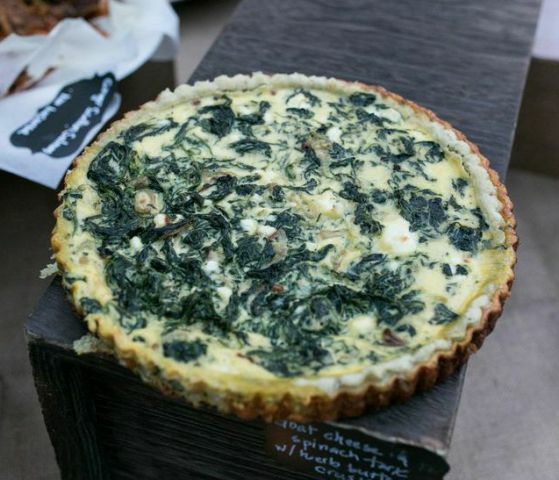 My goat cheese and spinach quiche with herb butter crust was just the thing. It’s also perfect for a Shabbat lunch, Sunday picnic or even Yom Kippur break-fast.Two notes about this recipe: first, it is inspired by my absolute favorite Julia Child, and resembles one of her recipes for an open-face tart. The second thing to note is that you can add any combination of fresh herbs that you like in the crust: sage, tarragon, mint or even cilantro. Get creative and enjoy. In a food processor fitted with a blade, add all crust ingredients except for water. Pulse a few times to mix. Begin adding water just until a ball of dough begins to form. Do not over-pulse. Remove dough and work on a lightly floured surface until you can shape the dough into a flat disk. Wrap in plastic and place in fridge for 1-2 hours or overnight. Roll out crust on a lightly floured surface until 1/4 inch thick. Carefully roll the crust onto your rolling pin and lay on top of spring form pan. Gently push the crust into the pan using tips of fingers and thumbs. Prick the bottom of the crust with a fork all over, You can get fancy with the edges of the crust, or just leave for a rustic look. Bake for 7-9 minutes. Remove from oven and let cool slightly. Whisk together eggs, cream, goat cheese, salt, pepper and nutmeg. Heat a pan over medium heat and add butter and olive oil. Saute the shallots and garlic for just 2 minutes or until translucent. Add the spinach and stir for several minutes to remove any excess water. Remove from heat and allow to cool for 5 minutes. Add spinach and shallot mixture to the egg mixture. Pour into prepared quiche crust. Bake for 25-30 minutes. Serve warm or room temperature. No fresh strawberries around? Try using jam in whatever flavor you like. Parsnips turn out to be good in desserts. Who knew? This mash-up of two beloved classics will test even the most restrained lover of sweets.